Scientists with NASA's Dawn mission have identified permanently shadowed regions on the dwarf planet Ceres. Most of these areas likely have been cold enough to trap water ice for a billion years, suggesting that ice deposits could exist there now. "The conditions on Ceres are right for accumulating deposits of water ice," said Norbert Schorghofer, a Dawn guest investigator at the University of Hawaii at Manoa. "Ceres has just enough mass to hold on to water molecules, and the permanently shadowed regions we identified are extremely cold -- colder than most that exist on the moon or Mercury." Permanently shadowed regions do not receive direct sunlight. They are typically located on the crater floor or along a section of the crater wall facing toward the pole. The regions still receive indirect sunlight, but if the temperature stays below about minus 240 degrees Fahrenheit (minus 151 degrees Celsius), the permanently shadowed area is a cold trap -- a good place for water ice to accumulate and remain stable. Cold traps were predicted for Ceres but had not been identified until now. In this study, Schorghofer and colleagues studied Ceres' northern hemisphere, which was better illuminated than the south. Images from Dawn's cameras were combined to yield the dwarf planet's shape, showing craters, plains and other features in three dimensions. Using this input, a sophisticated computer model developed at NASA's Goddard Space Flight Center, Greenbelt, Maryland, was used to determine which areas receive direct sunlight, how much solar radiation reaches the surface, and how the conditions change over the course of a year on Ceres. The researchers found dozens of sizeable permanently shadowed regions across the northern hemisphere. The largest one is inside a 10-mile-wide (16-kilometer) crater located less than 40 miles (65 kilometers) from the north pole. Taken together, Ceres' permanently shadowed regions occupy about 695 square miles (1,800 square kilometers). This is a small fraction of the landscape -- much less than 1 percent of the surface area of the northern hemisphere. The team expects the permanently shadowed regions on Ceres to be colder than those on Mercury or the moon. That's because Ceres is quite far from the sun, and the shadowed parts of its craters receive little indirect radiation. "On Ceres, these regions act as cold traps down to relatively low latitudes," said Erwan Mazarico, a Dawn guest investigator at Goddard. "On the moon and Mercury, only the permanently shadowed regions very close to the poles get cold enough for ice to be stable on the surface." The situation on Ceres is more similar to that on Mercury than the moon. On Mercury, permanently shadowed regions account for roughly the same fraction of the northern hemisphere. The trapping efficiency -- the ability to accumulate water ice -- is also comparable. By the team's calculations, about 1 out of every 1,000 water molecules generated on the surface of Ceres will end up in a cold trap during a year on Ceres (1,682 days). That's enough to build up thin but detectable ice deposits over 100,000 years or so. 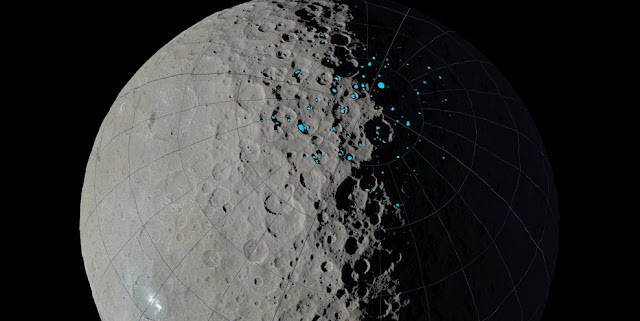 "While cold traps may provide surface deposits of water ice as have been seen at the moon and Mercury, Ceres may have been formed with a relatively greater reservoir of water," said Chris Russell, principal investigator of the Dawn mission, based at the University of California, Los Angeles. "Some observations indicate Ceres may be a volatile-rich world that is not dependent on current-day external sources." The findings are available online in the journal Geophysical Research Letters. Dawn's mission is managed by NASA's Jet Propulsion Laboratory for NASA's Science Mission Directorate in Washington. Dawn is a project of the directorate's Discovery Program, managed by NASA's Marshall Space Flight Center in Huntsville, Alabama. UCLA is responsible for overall Dawn mission science. Orbital ATK Inc., in Dulles, Virginia, designed and built the spacecraft. The German Aerospace Center, Max Planck Institute for Solar System Research, Italian Space Agency and Italian National Astrophysical Institute are international partners on the mission team.